Originally recorded over 70 years ago by Johnny Moore’s Three Blazers, this R&B holiday standard has been covered by a Who’s Who of music-industry royalty, including Chuck Berry, Elvis Presley, Bruce Springsteen, Etta James, Otis Redding, B.B. King, Melissa Etheridge and Christina Aguilera. 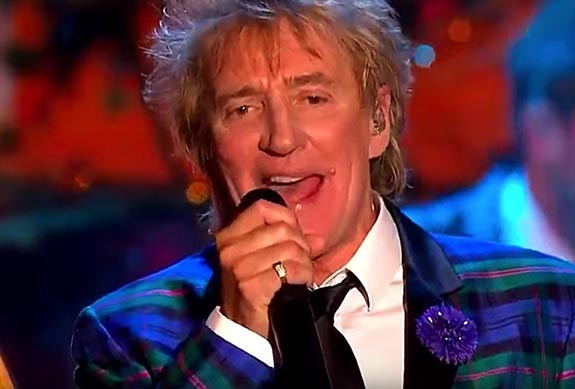 Sir Rod Stewart, who was knighted in 2016, is one of the top selling musical artists of all time, having sold more than 100 million records worldwide. Interestingly, his road to success was hardly paved with gold. Born in London in 1945, Stewart was the youngest of five children and aspired to be a professional soccer (football) player. He was also a big fan of Al Jolson, Little Richard and Bill Haley. Stewartreceived his first guitar as a 14 year old and performed with a local jazz group. At age 15 he dropped out of school and tried out unsuccessfully for a third division soccer club. With his career options limited, Stewart turned to music. In 1962, he and folk singer Wizz Jones honed their musical skills as they performed for tips on the street corners at Leicester Square and other London spots. They took their act to Paris and then to Barcelona, where Stewart was famously deported for vagrancy in 1963. Upon returning to London, Stewart joined the Dimensions as a harmonica player and part time vocalist. His big break would come four years later when he was recruited by Jeff Beck to be a vocalist for the Jeff Beck Group. “Merry Christmas, Baby” Written by Johnny Moore and Lou Baxter. Performed by Rob Stewart. Credit: Screen capture via YouTube/Petridisgeorge.